"We've constructed a perfect storm." 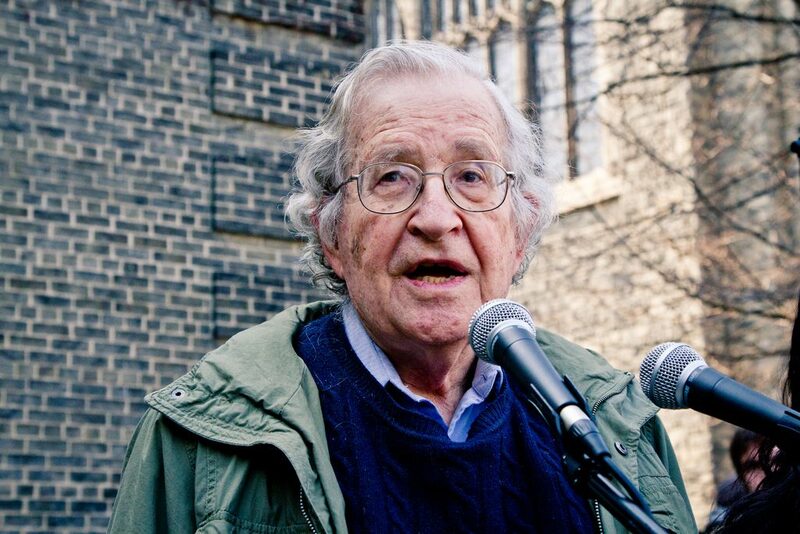 Noam Chomsky for 50 years has been America’s Socrates, our public pest with questions that sting … not the city-square of Athens but a vast global village in pain and now, it seems, in danger. The world in trouble today still beats a path to Noam Chomsky’s door, if only because he’s been forthright for so long about a whirlwind coming. Not that the world quite knows what do with Noam Chomsky’s warnings of disaster in the making. Remember the famous faltering of the patrician TV host William F. Buckley Jr., meeting Chomsky’s icy anger about the war in Vietnam, in 1969. It’s a strange thing about Noam Chomsky: the New York Times calls him ‘arguably’ the most important public thinker alive, though the paper seldom quotes him, or argues with him, and giant pop media stars on network television almost never do. And yet the man is universally famous and revered in his 89th year: he’s the scientist who taught us to think of human language as something embedded in our biology, not a social acquisition; he’s the humanist who railed against the Vietnam war and other projections of American power, on moral grounds first, ahead of practical considerations. He remains a rock-star on college campuses, here and abroad; yet he’s still an alien in the places where policy gets made. On his home ground at the Massachusetts Institute of Technology, he is a notably accessible old professor who answers his email and receives visitors like us with a twinkle. Over the years Noam Chomsky has defended his heavyweight debating title against all comers: YouTube has him in the ring with Michel Foucault on the nature of human nature; with Alan Dershowitz on Israel; with John Silber on Central America. But looking beyond his intellectual pugilism, Chomsky’s life might be defined as much by his allies as his enemies. 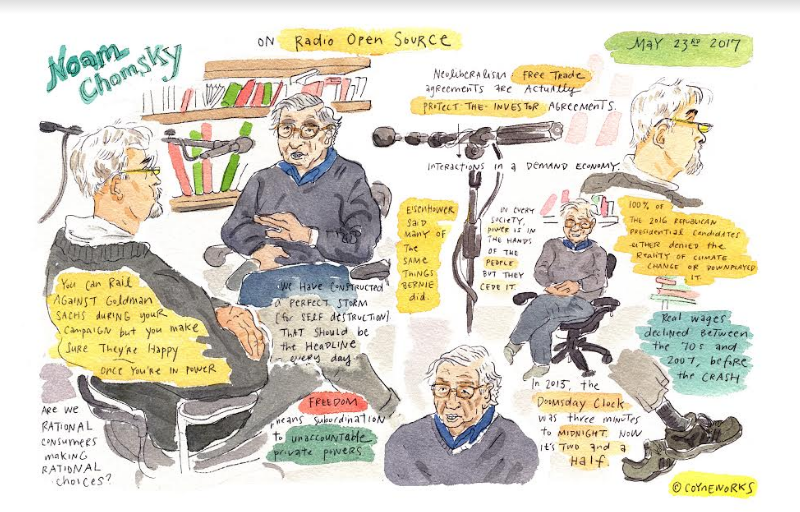 One of Chomsky’s longest running partnerships is with his assistant, Bev Stohl, who serves as the gatekeeper in and out of Chomsky world at MIT. She’s a sprightly writer and wit who’s learned over most of two decades that a lot of laughter helps in living with genius. We caught up with Bev and her office pup Roxy this week. 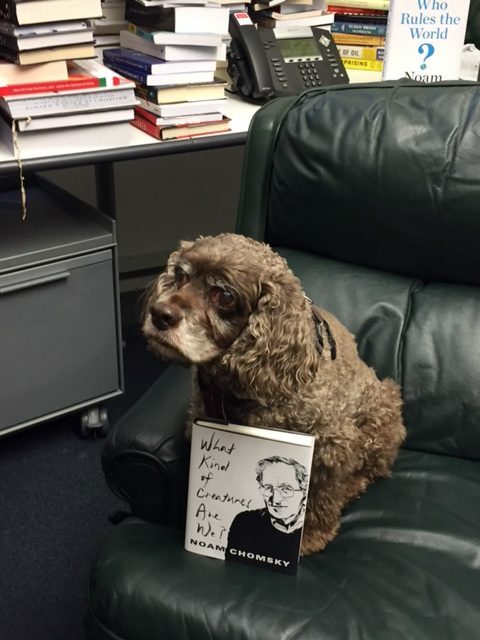 Another critical alliance comes from Robert Barksy, the author of two admiring, critical books—Noam Chomsky: A Life of Dissent and The Chomsky Effect: A Radical Works Beyond the Ivory Tower. As an admirer and biographer of Chomsky, Barsky helps us fill in the story of how NC became the most widely cited author and innovator in the literature of contemporary science as well as a by-word for rational humanism. Our hour only is only the beginning of the Noam story though. 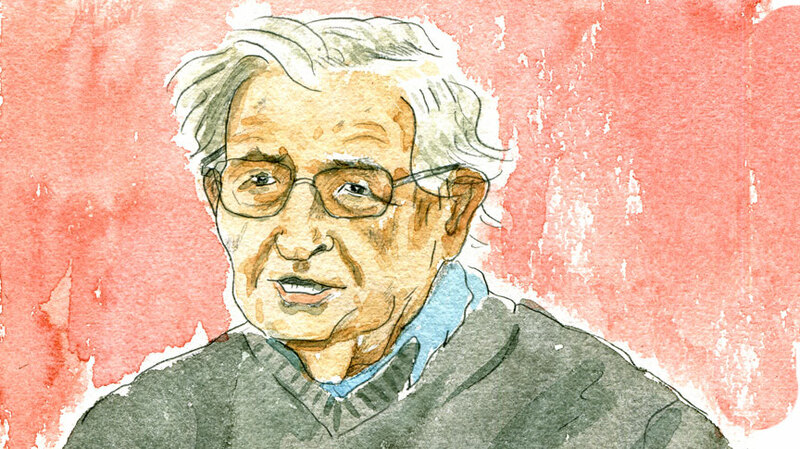 For more, read our friend George Scialabba‘s many excellent essays on Chomsky—a man he ranks among his triumvirate intellectual heroes (along with Christopher Lasch and Richard Rorty). Here’s a good place to start for beginners. Also, be sure to check out the Irish singer-songwriter Foy Vance‘s musical tribute “Noam Chomsky Is A Soft Revolution” which puts the linguist in a class of musical as well as political and literary dissidents—Dr. John, James Brown, and Willie Nelson as well as Jean-Paul Sartre, Fyodor Dostoyevsky and Che Guevara. Finally, watch these two bite-sized bits of Noam discussing two giant-sized philosophers, Bertrand Russell and Adam Smith. Also, read a full transcript of the show on Medium. “For brief introductions to the incredibly complex world that Chomsky describes, it might be worth watching a few videos. There is an incredibly important one that was done years ago on the BBC that offers a one hour summary of the basic philosophical tenants that underwrites his thought, and the interviewer is a very brilliant English philosopher. I have had occasion to talk about this interview with Noam and he agreed, and bemoaned that such programs are no longer easily found. Professor of English and French Literatures at Vanderbilt University and author of The Chomsky Effect: A Radical Works Beyond the Ivory Tower and Noam Chomsky: A Life of Dissent. Manufacturing Consent: The Political Economy of the Mass Media, 2002. American Power and the New Mandarins: Historical and Political Essays, 1969. Whether assessing U.S. policy in the Middle East (Fateful Triangle) or analyzing the events of September 11 (9-11), linguist, intellectual giant and moral authority Chomsky has made a brilliant career out of telling his fellow Americans things they didn't want to hear. And it all began with this collection of provocative essays (first published by Pantheon in 1969), each advancing a cogent, rigorous argument for why we shouldn't have been in Vietnam. In his opening piece, Objectivity and Liberal Scholarship, Chomsky establishes the premise that U.S. presence in Southeast Asia was little more than updated imperialism; that theory informs much of the writing that follows. In The Logic of Withdrawal, Chomsky methodically debunks the accepted reasons for U.S. intervention in a foreign civil war, and in On Resistance, he restates his case even more bluntly, writing that no one has appointed us judge and executioner for Vietnam or anywhere else. If it merely recalled the heady debates of a generation past, this volume would have been well worth reprinting. But at this moment in history, as America teeters on the brink of another war, Chomsky's ruminations about our role on the world stage take on renewed relevance. Copyright 2002 Reed Business Information, Inc.
How the World Works, 2011.